Nothing compares with fresh food taken straight from the garden; and while not everyone is lucky enough to have a garden, we are almost all able to make room for a few pots in which to grow our own food. A window sill is all you need to produce a selection of fresh herbs almost all year round. Herbs are delicious additions to cuisines of all kinds and are particularly useful as flavourings in low calorie foods, where you want to add intensity of flavour while limiting the use of fats and oils. You will enjoy using fresh herbs to develop your own individual style in recipes and to experiment with different combinations. What is more, a window sill garden is easy to create, is fun and will reward you with some of the best and cheapest fresh food you are likely to find. The bonus is how fragrant and pretty your window sill will be for most of the year. Young plants can be bought from garden centres, nurseries and even greengrocers in early spring and you should follow advice on when these can be planted out and when they are best grown inside. 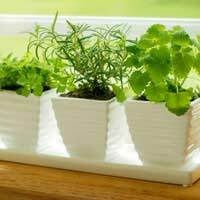 The sill outside your kitchen window is ideal; you are much more likely to use herbs when they are close at hand, and you will remember to keep them watered and cared for. Basil, strongly associated with use in tomato and pasta dishes, is a firm favourite. Two pots of fresh basil, placed on the window sill in good sunlight, should keep you supplied from spring to autumn. Keep them well watered and remember to pinch out the young leaves for use in cooking to help the plants stay bushy and healthy. The herb is an annual and you will need to replace the pots each year. Chives are part of the onion family. They have a subtle flavour and can transform potato salad and salad dressings. Chopped chives are delicious used with sour cream on baked potatoes and in soups. This is one herb that must be grown in a separate container because its growth will outstrip all the other herbs. It will grow in almost any situation but needs some sun and some shade, a little water each day and a feed once each year. A wonderfully refreshing herb, mint has several varieties, including spearmint, peppermint and apple mint. It adds fragrance to peas, beans and potatoes and is an attractive garnish for cold soups, salads and drinks. Probably the most familiar herb, in its curly and flat-leaf varieties, parsley is rich in vitamin C and helps to clean the palate for the next course during a meal. You may want to eat that garnish the next time it appears on your plate. If you are unfamiliar with herbs this is a good one to start with, since it seems to go with everything. Sprinkle chopped parsley on to soups, stews, casseroles and cooked dishes and use it in salads, sandwiches, dips and spreads. It can be grown all year round and does well in a large container if you can accommodate it. Give it plenty of water, moderate light and regular pruning to encourage new growth. This herb thrives in pots on a window sill, loving warmth and direct sunlight. Thyme helps in the digestion of rich and fatty foods so is often used in dishes containing cheese and eggs. Grow thyme in a coarse compost and water it just two or three times a week. You need only a little fresh thyme in your food to make an impact. You can also experiment with pots of lemon or caraway thyme. Let the plants flower in midsummer and then trim off the flower heads to keep the shape of the plant. This herb adds a clean, delicate sweetness to a sauce, dressing, omelette or marinade. A small sunny patch on the patio or a window ledge will be enough for all the tarragon you need. A strong-flavoured herb, rosemary is another herb that needs to be contained. It is very aromatic, smelling a little like eucalyptus, and should be used sparingly. A sprig can be enclosed in any chicken or meat dishes cooked en papillote (for example in greaseproof or baking paper parcels) and it makes a flavoursome addition to stews, casseroles, egg dishes and white sauces. It is very easy to dry and you can also open-freeze rosemary sprigs. When using fresh herbs in cooking, remember to wash them thoroughly in water and to dry them, either in a salad spinner or on kitchen roll. The more you use herbs, the more expert you will become at chopping them with a sharp knife. Some herbs, like chives, are best snipped with good kitchen scissors.